Loss of suitable habitat, instead of insecticides, seems to be the culprit in declining numbers of grassland birds. Know what else kills grassland birds? Ill-timed mowing … which a petition aims to stop in New York’s Hudson Valley. Meanwhile, in San Jose, Calif., officials are considering bird-friendly building regulations. 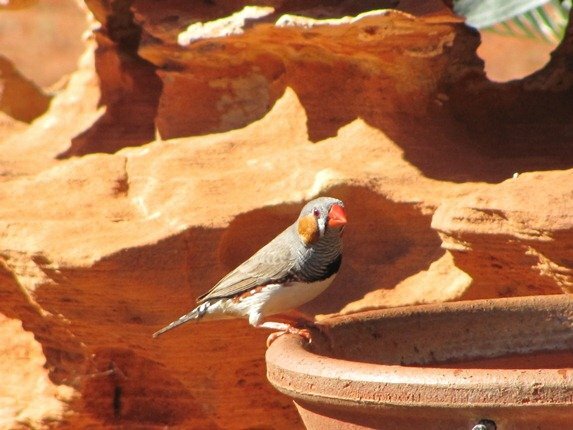 Female Zebra Finches are one-male birds in the wild, but not so in captivity. (Feel free to weigh in, down-under Clare, who also took the shot above!) Also in Australia, Bell Miner Birds may be damaging forests. Eurasian Blackbirds living in cities have learned to keep their cool, compared with rural birds. Planning on birding Kenya? Then you’ll want to check out this new book. Or maybe you’re visiting Belize, Guatemala, Paraguay, or the Bahamas? Then you might benefit from a new program training birding guides. Peep the new “ugly” baby ibis at the UK’s Kirkleatham Owl Centre. The last-of-its-kind bird that may have inspired the animated movie Rio is an ex-parrot. The first bird feathers may have been for showiness more than transportation. In a nod to Dr. Evil, a utility company in Hawaii is using lasers to keep birds from its wires and poles.